My picks for this week are slim. I’m still waiting on My Friend Dahmer GN to arrive at home. I thought I’d have it in my hands since last week but, oh well. World Reader has been a fun story. Issue number 5 is out this week and I can’t wait to dig into it. Meet Sarah, an astronaut traveling from dead planet to dead planet, talking to the ghosts of dead worlds... as she fights to discover the secret that’s killing the universe. But Death doesn’t give up its secrets so easily, and as she’s hunted from planet to planet, Sarah struggles to maintain the trust of her crew and her own sanity in the endless ocean of lives. Every world has a story, and if she can find the secret tying them all together, she can save Earth from being the next world to die. From JIMMY KIMMEL LIVE! 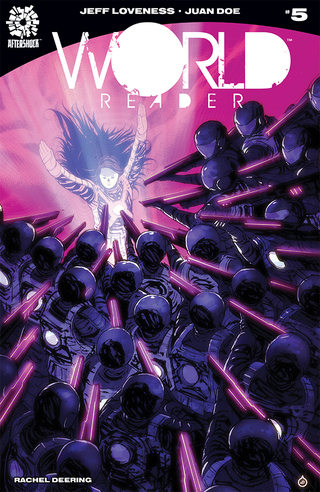 and GROOT writer Jeff Loveness and AMERICAN MONSTER and ANIMOSITY: THE RISE artist Juan Doe, comes the chilling, epic new series that will be sure to appeal to fans of ARRIVAL, INTERSTELLAR and THE EXPANSE. So what’s new with you? Any good stuff. You can include GNs, one-shots, comic strips and web comics.